Alistair Cooke was a British-American journalist, television personality and broadcaster. 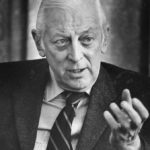 Outside his journalistic output, which included Letter from America and Alistair Cooke’s America, he was well known in the United States as the host of PBS Masterpiece Theatre from 1971 to 1992. After holding the job for 22 years, and having worked in television for 42 years, Cooke retired in 1992, although he continued to present Letter from America until shortly before his death. He was the father of author and folk singer John Byrne Cooke.